The SCENES panel can work either in manual or auto modes. When the 'ON' button lits red, the AutoVJ intelligent automation is active. When button is grayed, scene switching is only manually operated. Therefore, the operator will be in charge of selecting the scenes he needs during the show. Whereas in autoVJ mode, all scene selection is based on a set of predefined rules that are configured to each scene button. When all those rules are met, that particular button is activated. A third way in which scene switching can be operated is hybrid mode. HDVmixer's autoVJ mode will then be activated, but the operator will have the oportunity to manually select additional scene layers (like banners or captions). The autoVJ rules used to activate a scene are based on several conditions. These parameters are shown in the upper area of the SCENE panel ('AutoVJ Controller' area). Any of these variables (or a combination of several of them) can be used to trigger a scene switching. This data is constantly updated by AUDICOM, giving the user several degrees of freedom when planning to automate his video scenes. For example, a button could have the following rules: If MIC-1 and MIC-2 are on the air, then the preset should activate. This automation could be used to show a panoramic view of the studio when both studio mics are on the air. Another example might be: If AUDICOM is not playing video (is playing AUDIO or it is STOPPED), then enable a preset to display a still image background, a stream from a remote IP camera showing city traffic, and text with time & temperature information. In order for a SCENE button to activate automatically, a series of one or more AutoVJ conditions should be met. All the conditions configured to a particular button should be met simultaneously for the scene to go on-air. Note, that only SCENE buttons for the currently visible SHOW are evaluated in AutoVJ. So the station can have several sets of 36 scene buttons that can be switched to accomodate one show or another. Show selection is done by simply clicking the right show name/thumb in the show drop-down menu. Each rule can be triggered when certain condition is met, or it's not met. For example, a particular scene can be activated when the rule 'Block Type' is equal to 'BATCH' (commercial break), and another scene for all other conditions. This is useful to display a song name overlay during the whole programming except during commercial breaks. Flexible automatic video programming allows the broadcaster to have a very dynamic video product on the air with minimal manual intervention. HDVmixer monitors AutoVJ button triggering conditions constantly. If two or more scene buttons meet their respective triggering conditions, they are all activated. The only exception if they have contradictory actions. In this case, the button with a higher amount of rules is the one that while have higher hierarchy. This hierarchical algorithm makes those button which are activated by the audio console's faders to have a higher priority (they generaly have 4 rules) than those used to display a set during a commercial break (which have just one or two rules configured). Thanks to HDVmixer's AutoVJ, the business logic used for the video signal is customizable to meet the needs of every broadcasting event or show. The operator is free to activate/deactivate other scene buttons even when AutoVJ is active. If the button he is clicking on does not change the video source, set, or background, this means that the user is just wanting to add some image/text layers to the video image, so therefore the new button will become active and the AutoVJ mode will not deactivate. If the user is selecting a scene button that does change the AutoVJ's selected video scene, then the AutoVJ mode will deactivate (AutoVJ button will go gray), as he is manually overriding the automatic scene selection mode. Using information from AUDICOM's database, HDVmixer implements a series of 'metanames' (tags) that the user can use embbedded into the text fields. These metanames will then be replaced by the updated information field before going on the air. These fields will also be updated regularly while on the air. Also RSS feeds can be used to update crawling news layers. <BLOCK_TYPE>: Replaced with block type. This can be: Live, autoDJ, Batch (commercial break), Satellite Link, Internet Link, etc. <CLASS>: Replaced with the kind of content being played: Music, Promo, Spot, etc. Using metanames whilsly, on screen legends seem constantly changing in the broadcast, as if a graph operator is constantly watching out for changes. Layers which are time consuming such as: 'You are now listening to: Madonna, Beautiful stranger' are easily implemented in HDVmixer. It's just as simple as creating a new text layer with the following text in it: 'You are now listening to: <PERFORMER>, <TITLE>'. Metaname replacement works even when AutoVJ is disabled. So manually triggered titles can still contain metanames, or RSS feeds. BACKGROUND panel is where the background image of the current scene is selected. Whatever area that is not covered with one of the video sources on top, will display this background image. Like in the SET panel, the BACKGROUND panel has a set of buttons with a thumbnail of each of the available images. Background images can be BMP, JPG or PNG image files. Each background button has an associated name which corresponds to the name of the image file in it. The active background button is displayed with a red background in the button's name area. The background image can be selected independently from all other property. Changes in backgrounds are applied either when the PREVIEW/PROGRAM button is pressed, or automatically if the AUTO VIDEO button (found in the TRANSITION panel) is active. Background selection is stored as part of a scene configuration. The SCENE panel consists of 36 scene preset buttons that allow the user to switch from scene to scene with the push of a button. By right clicking on any button the user can edit the button's properties. Each scene button has got the following options: background selection, video source selection (for each of the 4 video mixer channels), video mixer SET layout and TITLE presets to be activated during the scene. These scene buttons can be automatically trigger based on specific user configurable rules. This auto-scene switching capability is called 'AutoVJ', as it acts like a VJ switching video sources during a live show. 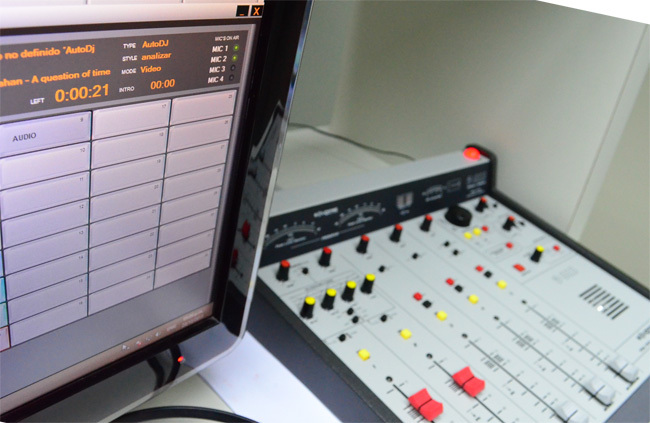 This is a crucial feature for Multimedia Radio transmissions, as the DJ is not distracted with an increased workload due to the new features of the broadcast. As shown in the above image, scene buttons have: a specific color (out of a set of 8), a name, a number (positions 1 through 36), and some small icons. These icons indicate what specific settings does the button contain. Buttons can: change the SET/SOURCE, can display TITLEs, and can have autoVJ automation rules. There are three distinctive icons to show each of these possible features that could have been configured to a particular button. The MONITOR panel shows a fixed image for each video source, so the user can easily identify each of the available options. HDVmixer supports up to 6 different video sources, as can be seen in the MONITOR's panel image. 5 of the video input feeds are user selectable, the sixth is always AUDICOM's own video playout signal. The sources for each of these inputs can be any combination between: webcams, professional camera inputs via Blackmagic capture cards, IP cameras, RTMP video streams, or even window desktop's captures (server's PC windows form). The later option is useful to generate virtual sources based on Skype Video or from a web browser. The video sources are defined in the application server. Besides showing the various sources, the MONITOR panel is used to manually select which sources will feed the built-in video mixer. Keep in mind that the following definitions: A SET in HDVmixer terminology is a particular configuration of the video mixer, which produces a specific video output composition. Several SETs compositions can be stored in HDVmixer as TEMPLATES, which can be easily go on-air with a single click. HDVmixer's built-in video mixer is capable of handling up to four simultaneous video feeds. The video mixer's input channels are identified with letters 'A', 'B', 'C', 'D'. Each SET template defines the position and size of each of these four input channels in the video output (PROGRAM). Most scenes will probably use one or two video sources, as it is rare in Multimedia Radio/TV applications to have more than two sources simultaneously on-air. The most widely used configurations use a single source at a time. For example, the most simple SET of all would be one that configures the video mixer to output channel 'A' input at 100% size. A more advanced SET would be one where a music video and a talent are displayed in a PIP (picture-in-picture) composition. If AUDICOM's playout video is set on channel 'A', and the talent camera on channel 'B', then we can easily configure a SET template that shows input channel 'A' at 100%, and channel 'B' in the upper right corner of the image with a size of 25%. To define which of the 6 existing video sources will be used in the SET composition HDVmixer has a 6:4 video input matrix. Each of the 6 sources has a series of 4 buttons that assign that input source to any of the four video mixer input channels. These buttons have the legends 'A', 'B', 'C', 'D' on top of each video source in the MONITOR's panel (as seen in the image on the right). 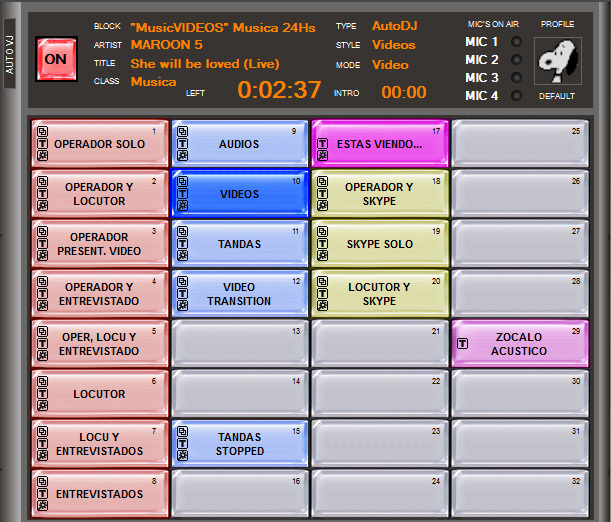 These buttons allow the user to quickly see which inputs are been used by the video mixer at any given moment in time. If all four buttons in a particular source are grayed, this means that the video source is not been assigned to any of the channels in the video mixer. While any of these buttons is illuminated, then it indicates that that video source is assigned to that particular mixer channel. For example, if all the 'D' buttons are gray, this indicates that channel 'D' is not been used (it has no input source assigned). On the contrary, if button 'A' is lit for source 5, it means that the video of source 5 has been assigned to the video mixer's channel 'A'. Any of the 4 channels in the video switcher can be assigned to any of the 6 available video sources. HDVmixer's video input matrix feature allows the software to be used not only in automatic mode, but as a conventional video mixer under manual operation. The video operator can 'punch' any video source to the output as required, not needing to configure a specific SET template for each of these scenes. Since in manual operation, the operator can set up a generic template with a SET where the channel 'A' is set at 100%, and then the video source selection is made using the input matrix (using the channel selection buttons available in each of the sources). The SET panel is where the video mixing configurations are selected. 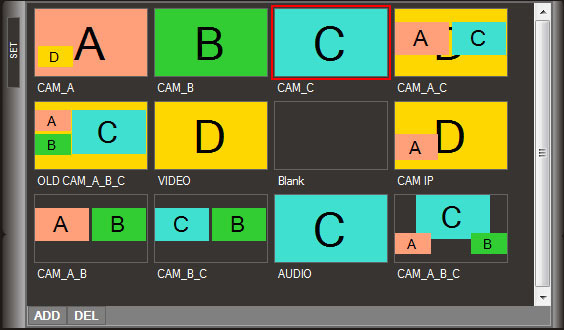 Using the four video sources selected in the MONITOR panel, the operator can choose a specific composition using those video feeds. This will define how the output (PROGRAM) video composition will look like on the air. SET presets determines the position, size and display order of each channel of the mixer's four video channels (A, B, C and D). Each SET preset is shown in the SET panel as a button. Each of these buttons has a name and a thumbnail (image) of the scene composition. To modify a preset, double clicking on the SET button of interest. A window displaying the above properties will show up. This edit window has a preset preview area to see how the new configuration will be displayed once on the air. This preview simplifies fine tunning the size and position of each video source in the final video composition, as it is visually displaying changes while they are being made. If the AUTO VIDEO button (on the TRANSITION panel) is grayed, then the auto apply changes is off. Therefore, clicking on a SET button will have no effect to the PROGRAM signal. It will only select the preset (with a green box around the button). To apply this new SET on the air the PREVIEW/PROGRAM 'bar' button in the TRANSITION panel must be pressed. If the VIDEO button is lit, then the changes will be applied into the main video output (PROGRAM). If the AUTO VIDEO button is enabled (red color), then clicking on a SET button means going on-air with that particular preset right away. When a SET preset is on-air HDVmixer indicates it by adding a red background to the legend with the name of the preset. Only one SET button can be active at any given time, as only one specific preset configuration can be aired.